We offer a full refund on Eternity Rose products under our Satisfaction Assurance policy if you’re unhappy with your purchase for any reason. 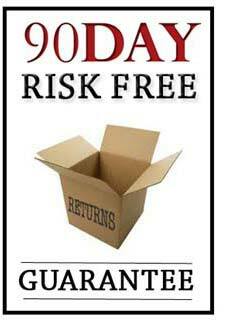 Simply return it before 90 days from the date of the invoice has expired. 1. Contact us by email so we know to expect your return, stating your initial invoice number. 2. Send any photos of damages if applicable. 3. Ensure you package your product(s) in the original condition, including any jewelry pouches, white mailing carton and Certificate(s) of Authenticity. 4. Mail the package to our US postal address below. 5. Send us the tracking number of your returned parcel. When we receive your returned product, we will process the refund and send you the full amount. Or, according to your preference, we will be happy to send a replacement. Note: The refund we issue back to you does NOT include the cost of return freight. We replace all warranty returns with a comparable item if the original item is no longer manufactured. For your peace of mind, we want you to know that to date, not a single product has failed during our warranty period because of a problem with the manufacturing. We maintain extremely high standards and quality control, to last an eternity. Can I send the product back because I want another style or color? Yes, if it is within the first 90 days from when the invoice is dated. You must return all the original packaging materials, and the product must be in good shape. If the packaging is missing or the product is not in good shape, we will charge a fee for restocking. What is the process for returning an item? First, send us an email letting us know that you want to return the product. Let us know the reason and state the initial invoice number. Please note that we do NOT reimburse the cost of return shipping. What if I receive a product that has arrived damaged? The first thing you need to do is photograph the damage to the product and email the photo to us. If you are unable to do that, simply email us and describe the damage. Then you need to send it back to our company and include the original packaging. As soon as we receive the product, we will either ship out a replacement, or we will send you a full refund of the purchase price, whichever you prefer. Please note that we seldom have a problem with a product arriving damaged because we package each item thoroughly. The products are also protected by our very sturdy presentation boxes. Who pays the cost of return shipping? The customer pays for return shipping when a product is returned to us. The official term for this is a RTB (return to base) warranty. How long do I have to wait for warranty processing? As a rule, we can process the refund or replacement the same day or the next business day after we receive the product. Who pays for a replacement to be shipped to me? We cover the cost of shipping to send you a replacement product. If I post an item back and it gets damaged during the return, what happens? This is not something you have to worry about. We provide a replacement or full refund, regardless.